We all want to make a risky wager but we know the odds we will win aren’t great. However, some blackjack players have taken that risk and they’ve paid off. These include five lucky players who went all in and won. 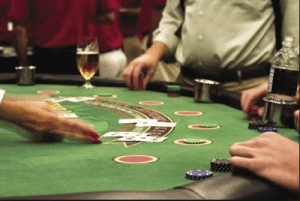 An 18 year old boy was playing blackjack at Mystic Lake Casino in Minnesota. He was playing a six deck variant and was seated alongside a group of players who had a lot of experience in the game. The boy was dealt 17 and the group of adults had accidentally seen the dealer’s cards, which totalled 18. The boy planned to stand, due to basic strategy, but the adults told him he would lose if he didn’t Hit. The boy said “you aren’t supposed to hit” but after the group convinced him he went all in and Hit. He landed a three and won big. While the basic strategy is recommended to lower the house edge, the outcome is a statistic and will not always result in a win. Sometimes a risk can pay off big. A low limit player was seated at a blackjack table, making $10 wagers as he played. He was then joined by a high roller who was making $1000 wagers and making rude comments to the low limit player. He continued to make jabs, while the low limit player ignored him. Finally, the high roller asked to ride the low limit player’s $10 wager as he was on a streak and he agreed. The low limit player then busted on purpose, making the rude high roller lose thousands. While the low limit player lost his wager, he ultimately won by going all in as the high roller ended up leaving the table. A female player joined a table featuring a group of experienced 21 players. Each were dealt their hand, and the female player landed blackjack. Instead of choosing to stand and wait for every other hand to finish, she chose to Double Down. Every player at the table laughed at her, but she was defiant in the all-in move. The odds were against her – she was risking a certain win for an unknown chance at 2x her bet – but she won and the table all shut up as she was paid her winnings. While it is incredibly risky and does increase the house edge, it can be a fun move which may just pay off. A player takes a seat at a table which is almost full, and joins in on the game. Each player is dealt a hand and everyone at the table opts to stand, with the dealer showing a four. The pit boss comes over to dispute the issue and the dealer is told to return the card. The dealer then asks what the player wants to do. The player doubles, going all in, and scores a two for their hand, landing them 21. 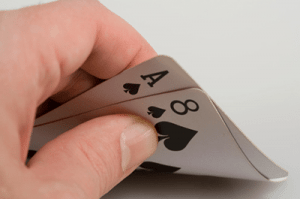 The next card ended up being a six which meant the player would’ve landed a 19 – what the dealer ended up getting – to a free Double Down 21. 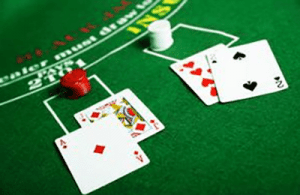 This shows it might pay off to go all in and join a table of players who don’t really know what they’re doing – you may end up getting a free peek. One veteran casino player has told a blackjack forum when he was 23, he headed to Las Vegas with his life savings in his pocket. He had read every blackjack book he could, and although he was quite the amateur, after three weeks of going all in he had doubled his bankroll. He noted some of his favourite games on the Strip to go all in, including four deck blackjack tables at Caesar’s Palace and six deck tables at the Holiday Inn. 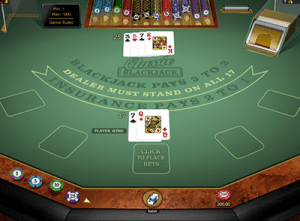 If you want to go all in you can head to Casino-Mate and play Microgaming’s Classic Blackjack variant, with a house edge as low as 0.13% available when the perfect strategy is in play.